One of the easiest ways to save money and eat healthier is to cook meals at home. Eating at restaurants can be pricey and you don’t have control over the ingredients used to make the meals. Often times, restaurant and takeout meals have a lot of added salt and fat. When you cook at home, you can season your food with fresh herbs instead of salt. You can choose to bake or sauté a fresh piece of fish instead of ordering a previously frozen filet that has been deep-fried. Choose to make going out to eat an occasional treat rather than a daily habit. It’s helpful to create a meal plan for the week. I usually do my meal planning and grocery shopping on Sunday mornings so that I’m ready for the work week. Pick a day that works best for your family to sit down together and decide on meals that everyone wants. Look for healthy recipes with short ingredient lists. Pick at least a few recipes that use less-expensive protein options like chicken, lean pork chops and black beans. Choose a few recipes throughout the week that call for the same main ingredient (for example: baked chicken breast with roasted veggies, chicken salad sandwiches on whole wheat bread and quinoa bowls with diced chicken and fresh veggies). I also like to use leftovers to make another slightly different meal. If we have tacos on Tuesday night, we will have taco salads for lunch on Wednesday. Pick 1 or 2 whole grains to add as a side with your meals. A bag of brown rice and a bag of quinoa are healthy and cost-effective options. Aim to have at least 1 fruit or veggie with each meal. Here are some more helpful tips for meal planning. Once you have a meal plan for the week, you can use that to write a detailed grocery list. I find it helpful to organize my grocery list by category, like: produce, bakery, meat/seafood, deli and refrigerated. Organizing by category makes it easier to move quickly through the grocery store. Making a detailed grocery list of everything needed for the week will help save money because you won’t spend money on extra ingredients that aren’t needed. Eat something before going grocery shopping and don’t shop when you’re hungry. This will help you say ‘no!’ to tempting sweets and snacks. Stick to your list and use it as a guide through the store. Bring a pen to cross items off of the list so that it is easy to see what you still need to put in the cart. Encourage your kids to help pick out fresh produce and let them use a colorful pen to cross items off of the list. Kids are more likely to try new foods if they are actively involved with this process. 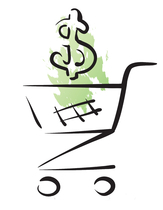 Does your favorite grocery store offer an incentive program? Many offer coupons and rewards for buying store brand products. Ask next time you are shopping and be sure to take advantage of the weekly deals being offered. Choose fresh, local, in-season fruits and veggies when possible. These are usually more flavorful and less expensive. Many grocery stores offer a locally sourced section in the produce department. You can also find great fruits and veggies at farm stands and farmers’ markets. During the winter months it can be difficult to find fresh, local produce. It is completely okay to buy frozen and canned fruits and veggies. The nutritional value is the same for most items (just make sure you choose ones that don’t have added sugar or salt). Frozen and canned items are usually very cost-effective options. "I used to pick up a medium iced latte with caramel swirl and whole milk each morning on my drive to work. I didn’t think twice about it. A few months ago, I did the math for my morning coffee habit and was shocked to see that each cup had about 350 calories and cost about $3, which added up to $21 a week. I immediately decided to start bringing coffee from home instead. I now make my own iced coffee with a splash of unsweetened vanilla almond milk. My drink is now about 10 calories and I save about $15 and reduce my calorie intake by 2,380 each week. This simple switch makes a huge impact on my health and wallet!" Bonnie earned a BS degree in Community Health Education from the University of Maine at Farmington. She is a certified health education specialist (CHES) and works as a health educator with the MaineHealth Learning Resource Center.